One of the best parts of working for a company whose mission is to improve the quality of life for people is not only seeing that happen, but telling those stories so that others may have hope. At Lingraphica, we have the privilege of hearing some incredible stories of people who have regained their voice after stroke, disease, or injury. Here are four from 2017. 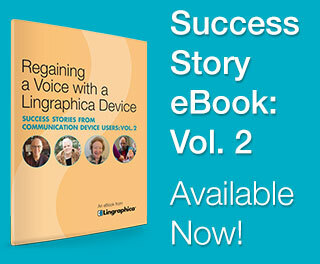 We’re thrilled to present our second collection of success stories from people whose lives have changed dramatically by using a Lingraphica communication device. Read the beginnings of the journey for Jack, Jo, Roseanne, and Butch. For their complete stories, download our latest success story eBook for free at the bottom of this post. Jack Burnetti began mixing up his pronouns and dropping verbs from sentences. The Italian was disappearing from his vocabulary. He struggled to find words. As his language impairment progressed, his wife Diana took him to a doctor near their home in Scranton, PA. Jack underwent a battery of neurological tests, but doctors found nothing conclusive and said that he had a mini-stroke. Diana and their son, Steven, sat with this news for a while, but believed that something else was going on. At the beginning of her career, Jo Free worked as a diagnostician in the field of education. Always an advocate for those with special needs, she advanced through the years and retired as the Director of Special Education Services with Comal County. While in retirement, Jo was active as ever, running five miles 3-5 times each week and participating in a weekly spin class. At age 66, Jo--the determined, fit, and independent woman who lived life on her terms--had a massive stroke. In May of 2015, Rosanne Knapp suffered a severe stroke. The former technology recruiter, Alzheimer’s facility worker, and author of the book Southern Wind was 64 years of age and retired at the time of her stroke. In December 2013, Butch Goodwin of Jacksonville, FL, suffered a severe stroke. The former logistics employee of Walmart was 39 years of age and working at the time of his stroke. Butch experienced a left-sided ischemic stroke, which affected his motor function and communication. He worked with a speech-language pathologist in an inpatient setting, at home, and at a neurological day treatment center through Brooks Rehabilitation in Florida. Within a few weeks, Butch began working with a Lingraphica speech-generating device to help with his communication. For the rest of these incredible stories, download the eBook today.